Happy New Year everyone! Thank you so much to everyone that came to see our Christmas program. It was such a cute show and it looked like the kids had a great time. Also, thank you to all of you who sent in baked goods, gifts and cards for the holiday. It is truly appreciated by the whole staff. We feel so blessed to be able to help your children grow. We have had a great start to our week and everyone has been happy to be back at school. We also have a couple of new students in the Orange & Green classes and they are adjusting well. January will be a busy month with gathering information for progress reports, scheduling parent/teacher conferences, and registration for next school year. Parent/Teacher conferences will be on a different day for each class. Please be on the lookout from a notice from your teacher about what day your conferences will be and to then schedule a particular time on that day. You will receive your child’s progress report at or before your conference. It can also be helpful for you to bring a list of questions already prepared that you want to ask your child’s teacher. I know that once I get to a conference for my own children, I often forget what I have been wanting to ask for the last few weeks. Conferences will likely be the last week of January or first week of February. Registration for next year officially started January 4. All information is available online along with the application. Priority registration for current students and church members goes until Monday, January 18. Be sure to put in your application by that day to guarantee a space for next year! If you have any questions, please let me know. The weather is going to be cold. Please be sure to send in appropriate and labeled (with your child’s name) outerwear. We will try to go outside if the temperature is above 32 and there is no precipitation. The month of December has been filled with lots of great learning and fun! Literacy- This month we enjoyed reading many Christmas themed stories. Math- In math this month, we enjoyed making a “Favorite Christmas Food” graph and playing Christmas themed math games. Social Studies- In social studies this month, we enjoyed learning about Hanukah, Kwanza and Christmas. Art- In art this month, we made silver bells, gingerbread men, Hanukah menorahs, and Kwanza mats. The month of January will be equally as exciting. We will explore winter, have fun in our hot chocolate bar and learn about Abraham Lincoln, George Washington and Martin Luther King JR. Happy New Year! 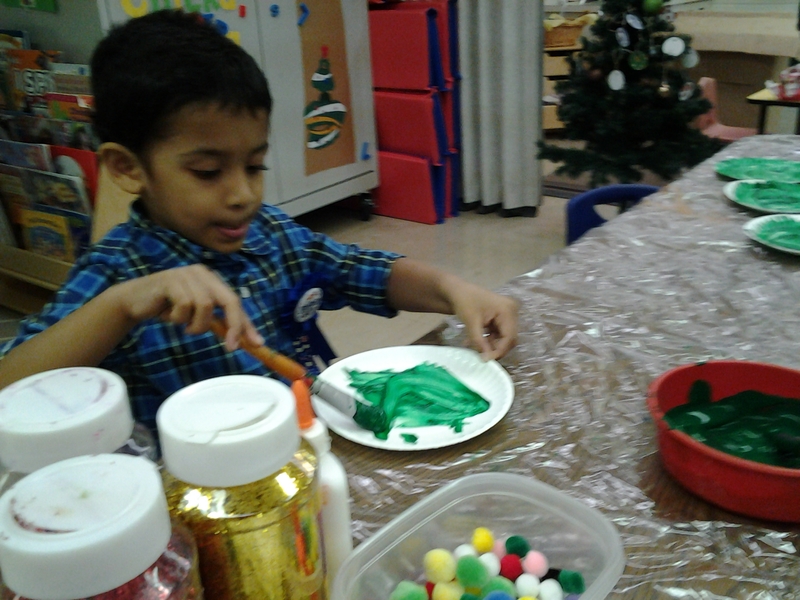 We hope that everyone had a restful holiday break and are ready for another month of fun in the Blue Class. December was a short but busy month as we excitedly counted down to Christmas. We learned about diversity as we discussed different holiday traditions. 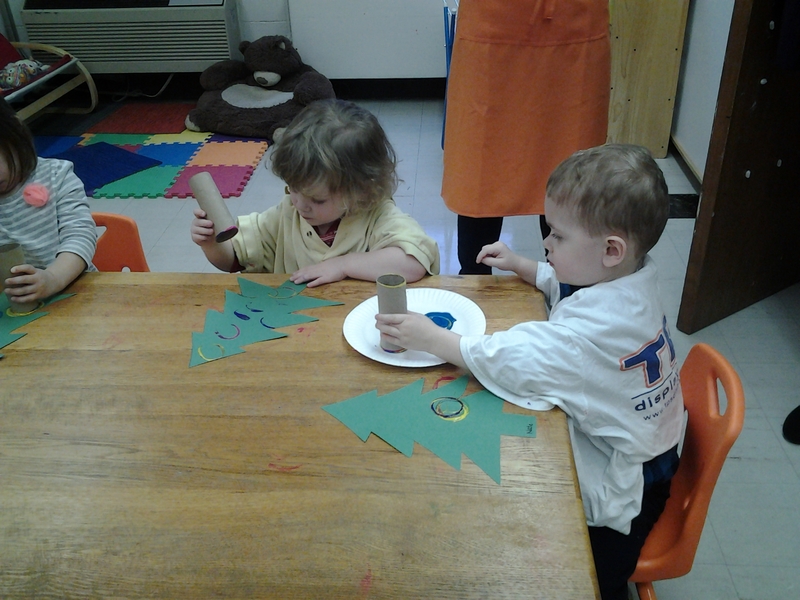 We made Christmas tree name puzzles and handprint menorahs. The children enjoyed creating and decorating their own class gingerbread house. We read about the Nativity Story and the eight nights of Hanukkah. We sang & sang as we prepared for our Christmas performance. Their hard work paid off as it was a successful show and such a wonderful experience for the children. January’s themes will include the changing seasons and snow. In science, we will experiment with water as a solid, liquid and a gas. We will make snow for our sensory table & create sensory bottles to represent different types of weather. The students will practice with scissors to make snowflakes & spell their names out of marshmallows. We will read about animals of the Arctic & make paper plate penguins. We will continue to work our way through the alphabet in our journals, practice our sign language and review our Spanish words. Happy New Year Everyone! I am so excited to be back at school! The holidays are such a fun time but I’m excited to get back into the classroom. This first two weeks of this month will be spent in a unit called Winter Wonderland. During this unit we will be talking about winter and snow. The children will get to make snowflakes, create soap snow, and even make snow cones! As we move into the second half of the month, we will turn our focus to the weather. We will talk about the different types of weather, sing our weather song, and create some fun, stormy projects! I hope you all had a wonderful holiday and here’s to a great new year. 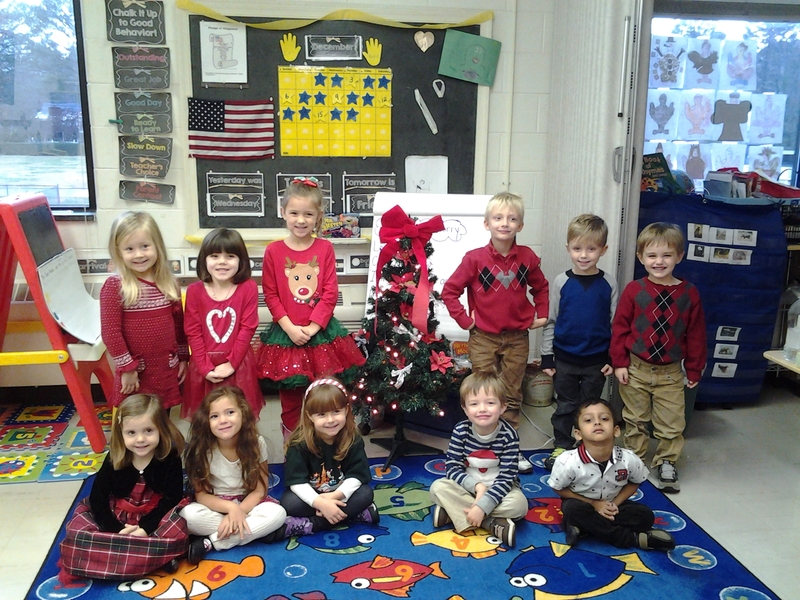 December was a magical month in the Orange class! We spent our days together decorating for Christmas, preparing gifts, doing Christmas arts and crafts, reading Christmas stories, and learning the story of the Nativity. Mrs. Martin, Mrs. Schuetze, and Mrs. Hayden would like to thank all of the Orange class parents and family members for your thoughtfulness in remembering us at the Holidays. We appreciate your kindness and generosity throughout the year. We were so happy to see so many of you at the Christmas performance and enjoyed sharing the holiday festivities with you and your children. After a nice long Holiday break, we are excited to begin the new year together. As we get back to our Orange class routines, we will once again turn our focus to the weather. We will take note of the colder day (we hope), talk about snow and ice, and learn what various animals do during the winter. In particular, we will learn a little about the animals that hibernate. We will also talk about animals such as penguins and polar bears that live in places where it is cold all year long. Please keep in mind that even though the weather will start to turn colder, we will still be going outside to play each day as weather permits. On colder days, our playground time will be shorter, but we do enjoy the fresh air, if only for a few minutes. 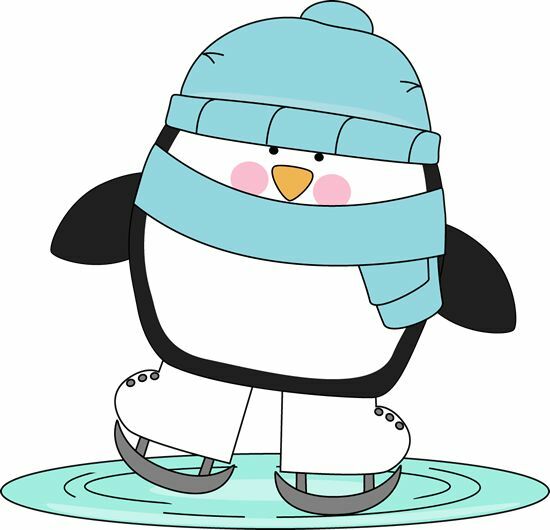 Please be sure that your child has a hat, gloves/mittens, and a warm jacket(all labeled with his/her name) at school each day. Welcome back and Happy 2016! As we embrace the new year, we will begin to introduce new concepts and activities. 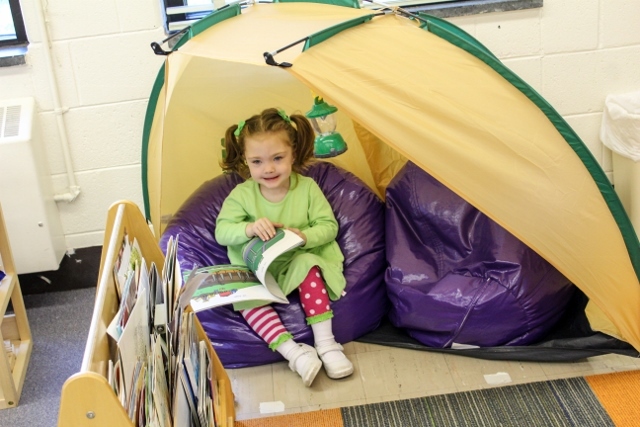 While we may have to refresh our memories about classroom routines, it shouldn’t be too difficult to get them back into the swing of things and so we can begin to set our play in a more educational direction. This month, the children will become familiar with the color blue. It will be all things blue in the green class! I will also place some emphasis on recognition of the letters A, B, and C, as well as the alphabet song. We will be welcoming some new friends this month, which means we may also have to revisit some “sharing” and “playing together” lessons. I am excited, to start the new year and get back to working with your children! On Thursday, January 21 we will be having our 2nd annual winter dance party during school. The dance party will be at 10 am followed by a special snack inside the classroom. Your teachers will send home a sign up or request for a snack for the class for that day. If your child does not normally come on Thursdays, you are welcome to come to the dance party with them and stay through snack in the classroom. Please be sure to let your teacher know if you will be joining them or not to make sure we get enough treats to go around.